B cells, also known as B lymphocytes, are a subtype of lymphocyte in white blood cells . They play a critical role in the humoral immunity component of the adaptive immune system by secreting antibodies. They also function in immune system as antigen presentation cells and by secretion of cytokines. CD19 (Cluster of Differentiation 19) is an important surface marker for B cells from earliest recognizable B-lineage cells during development to B-cell blasts but is lost on maturation to plasma cells. CD19 primarily acts as a B cell co-receptor in conjunction with CD21  and CD81. Upon activation, the cytoplasmic tail of CD19 becomes phosphorylated, which leads to binding by Src-family kinases and recruitment of PI-3 kinase. iXCells Biotechnologies offers CD19+ B Cells isolated from normal human peripheral blood mononuclear cells (PBMCs) using positive immunomagnetic selection. 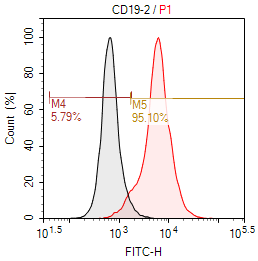 > 90% of the cells are CD19+ as showed by flow cytometric analysis (Figure 1). Figure 1. Flow cytometric analysis showed that >90% cells are CD19 positive. Murphy, Kenneth. 2012. Janeway’s Immunobiology 8th Edition. New York, NY: Garland Science. Bradbury LE, Kansas GS, Levy S, Evans RL, and Tedder TF. “The CD19/CD21 signal transducing complex of human B lymphocytes includes the target of antiproliferative antibody-1 and Leu-13 molecules”. Journal of Immunology 1992; 149 (9):2841-2850.